Griselda Gehman was an only child, born in Newark, Delaware to parents of Pennsylvania Mennonite origin. Her grandfather, William Hiestand Gehman, had moved from Lehigh County, Pennsylvania to the state of Delaware, where he married Lucy Thomas in 1896, and their son Gilbert (Griselda’s father) was born in 1898. As there were no Mennonite churches in the area, they joined the Methodist church. In 1921, Gilbert Gehman married Elizabeth “Lizzie” Hiestand of Chapel, Berks County, his father’s younger first cousin. 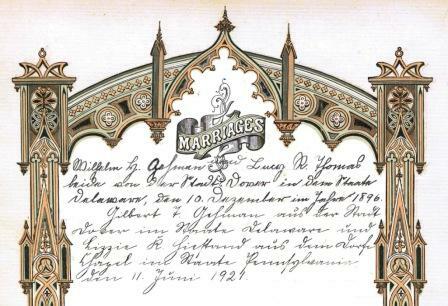 The marriage was recorded in old-fashioned German script below that of his parents in the family Bible. Wilhelm H. Gehman und Lucy R. Thomas beide von der Stadt Dover [both of the town Dover] in dem Staate Delaware, den 10 Dezember im Jahr 1896. Gilbert T. Gehman aus der Stadt Dover im Staate Delaware und Lizzie K. Hiestand aus dem Dorfe [village] Chapel im Staate Pennsylvania den 11 Juni 1921. The certificate page records Gilbert’s grandparents’ marriage, William M. Gehman and Susanna Hiestand, at Clayton, Berks County, in 1872. The same calligraphy (by an unknown artist) continues to record the birth of sons David and William in “Nieder-Milford Taunschip, Lecha Caunty [Lower Milford Township, Lehigh County]” in 1873 and 1874. Gilbert’s birth, his brother William, and Griselda’s birth were added in script below. Also included is an English register (from a separate Bible) for Gilbert & Lizzie Gehman. Gilbert Gehman, raised in the Methodist church, became a well-traveled Methodist minister. His gravestone in the Upper Milford Mennonite Cemetery contains a case of stones he collected on travels through 26 states and 10 countries during a short life. He died of peritonitis at the age of 34. There is an interesting account, written by Griselda Shelly and published in Mennonite Life (June 1983, pp. 25-27), of a letter her father Gilbert received from Mahatma Gandhi in 1931 while serving as pastor of Cookman Methodist Church in Columbia, PA. Ghandi wrote: “Dear Friend, I must thank you for your letter of 15th Nov. last. I am glad that your congregation appreciates the non-violent means we are adopting to regain our lost liberty. Yours truly, M K Gandhi”. You can read Griselda’s article here. Lizzie, Griselda and Gilbert Gehman, circa 1933. Griselda also possessed the registers of her grandfather Nathaniel C. Hiestand (1857-1929) and his brother Samuel C. Hiestand (1854-1929). Samuel had only one child who lived to adulthood, and no grandchildren, so the register was passed to Nathaniel’s family. Samuel and Nathaniel married sisters, Mary and Hannah Kratz, daughters of Daniel & Hannah Boorse Kratz of Frederick Township. Their sister Susanna Hiestand married William Gehman and was Griselda’s great-grandmother on the paternal side. The Hiestand siblings were all married by their maternal uncle Christian Clemmer, bishop in the Hereford Mennonite congregation. Nathaniel attended the Hereford church and was buried there. Samuel was buried at Eden Mennonite Cemetery, Schwenksville, and Susanna at Upper Milford. Samuel & Mary Kratz Hiestand marriage record, 1877. Nathaniel & Hannah Kratz Hiestand marriage record, 1881. 1) A friendship quilt at the MHC that was made by Mary and Hannah Kratz’s sister-in-law Maggie Heimer Kratz Cassel in 1936 for her grandson, Noah Mack, at his wedding; it later went with Noah and Murial Mack to Africa where they served as missionaries. The names of Lizzie Hiestand Gehman (Griselda’s mother) and Geneva Hiestand are on the quilt. 2) Another friendship quilt at the SLHC attributed to Hannah Kratz Hiestand that bears names from the Boorse family and others. 3) Three fraktur bookplates at the SLHC that were made by schoolmaster Andreas Kolb for Anna Geissinger (Clemmer) (1787-1872), grandmother of the Hiestand siblings — one for her manuscript tunebook, dated 1798; her catechism, 1803; and her copy of the newly-compiled Mennonite hymnbook, Zions Harfe, 1804. The hymnbook also contains a family register for Anna and husband George Clemmer. George and Anna Clemmer raised their family in Hereford Township, in the house pictured below. Their children included bishop Christian and preacher Samuel G. Clemmer (1821-1870), who served as pastor of the Philadelphia mission of the Eastern District Conference. Later, this house was the childhood home of George & Anna’s great-granddaughter, Annie C. Funk, who went to India as a missionary and died in the wreck of the Titanic while returning to America in 1912. I’m interested in learning about the Bean family — the family of my maternal grandparents. I knew of them living in Ferndale and being members of the Lutheran church. You can read a bit about the Bean family in this blog post: http://mhep.org/immigrant-heritage-bean/ We don’t have a lot of information on the Ferndale Bean’s, but I know there were many there.